Looking for Mustang car shows and pictures? This is the place to start. You can find information on upcoming shows, pictures and links for Mustang Shows and events. The information below includes both, Mustang car shows and other events which either feature the Ford Mustang or are Ford shows with Mustang entries. Depending on where you live, there are still some shows left for the 2012 season. Here's a link for the rest of the year's Ford Mustang and Shelby Shows and Events for 2012. Living farther north? 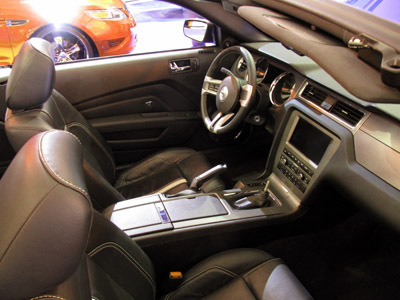 To give you an idea of what's coming up for 2013 in your area, check out the 2010 listings on this page and the 2011 Ford Mustang shows . Most of these are annual events. Can't find one in your area yet? A link for the new shows for 2013 is coming soon! The Vancouver International Auto Show was a great hit. The people from Ford had a bevy of beauties for all to see (Mustang's of course). On exhibit, were a bright red 2011 Mustang V6 convertible with the deluxe interior, a Robins egg blue 5.0 Mustang GT coupe and a Dark Argent 2011 Shelby GT500. Here are the full details from the 2010 Vancouver International Auto Show. * Ford Racing Mustang Challenge - Virginia International Raceway in Alton, Virginia. * BC Classic & Custom Car Show - Abbotsford, BC Canada Plenty of great Mustangs and Shelbys were on display at this annual event, including a 1978 Mustang ll Monroe Handler. See the pictures and information from the show. * The 25th Annual Fabulous Fords Forever - Knott's Berry Farm, Buena Park, California. Billed as the most gigantic car show ever, features Fords from 1903 to present and includes some jaw dropping Ford Mustang restorations. Cars from 10 states and several provinces in Canada took part in the fun and festivities. * Jack Roush Meet and Greet - Livonia, Mich.
* Restomods In Reno 2010 - 2500 East 2nd Street Reno, NV. All Fords welcome, original, mild and wild classes. Jack Roush Meet and Greet - Livonia, Mich.
Jack Roush Meet and Greet - Knoxville, Tenn.
Jack Roush Meet and Greet - Salina, Kan.
Am I Missing some Mustang Car Shows ? If I missed your show, drop me a line and I'll list it. If you know about other upcoming Mustang car shows or you have just been to one, why not contribute? There's a Contact form at the bottom of the page. Send me some information and I'll post it here. If you have some great Mustang pics, I'll see what I can do to get some up for everyone to enjoy. Note: If you have a technical question, please supply as much information as possible. (ie. year, model,engine) and exactly what's happening now. Same thing goes, if you have an answer or solution you'd like others to know about. What Other Ford Mustang Enthusiasts Have to say..